Right Sector has threatened to deploy all of their armed and trained battalions – “if necessary” – to convince the Kiev government to bow to their demands, as an armed standoff between authorities and nationalists continues in western Ukraine. “In the conflict zone [Donbass region] we have two battalions, but we have 18 or 19 reserve battalions spread across Ukraine,” Right Sector spokesman, Artem Skoropadsky told a press conference in Kiev. 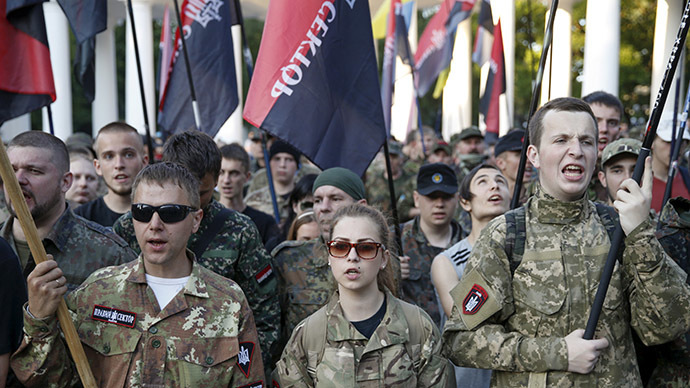 Meanwhile Right Sector fighters, who were taking part in the so-called “anti-terrorist operation” left their positions in the country’s eastern Donetsk Region, and returned to their “bases,” another Right Sector spokesman Andrey Sharaskin told Ukraine’s 112 channel. As for the “reserve battalions,” Sharaskin claimed that “over 10,000 activists have been mobilized all across Ukraine” due to tensions with the authorities. The nationalists have already began setting up checkpoints on the outskirts of Kiev, in order to try and prevent any reinforcements from moving on to Mukachevo, where a group of militants still refuse to surrender following Saturday clashes. Meanwhile reports emerged that authorities were also deploying additional units near Right Sector training camps and bases, in order to block them if the nationalists carry out their threats and try to deploy forces elsewhere in the country. “Our brothers acted within the framework of necessary defence,” Yarosh claimed, blaming authorities for the violent incident. Right Sector activists are holding rallies in 17 cities across Ukraine in support of the radical brigade, which they present as heroes who were standing against corrupt authorities and acted in self-defense. “The protests have been announced in Kiev, Dnepropetrovsk, Odessa, Zaporozhye, Ternopol, Mariupol, Kherson, Kramatorsk, Poltava and other cities of Ukraine,” the statement on the organization’s website says. On Saturday, up to two dozen heavily armed fighters wearing camouflage uniform and bearing Right Sector insignia engaged in conflict with local authorities, business owners and police. As they were trying to flee the scene, the gang members were shooting Kalashnikovs and heavy machineguns mounted on their SUVs, as well as grenade launchers. After the shootout the Ukrainian security forces said that three attackers were killed and a total of 10 people, including five law enforcement officers, were injured. The group took shelter in the woods on the outskirts of Mukachevo, and have so far refused to surrender and lay down arms without Yarosh’s orders, threatening to open fire if authorities move in to detain them. While authorities claim that two of the fighters had surrendered on Sunday evening, the group insists it was purely to save their lives as they had been injured and needed hospitalization. At the same time reports emerge that the group have already breached out of the the encirclement after getting rid of their wounded. “They have not surrendered their arms and do not engage police,” the governor added. The OSCE Special Monitoring Mission (SMM) that arrived in Mukachevo to meet with authorities and observe SBU operations noted that Kiev is increasing its troops in the Carpathian region. The team witnessed a “Ukrainian Armed Forces convoy moving towards Mukachevo, comprised of 11 APCs, two trucks loaded with soldiers and one fuel truck,” SMM said in a statement. On their way to Mukachevo, the SMM observed heightened security measures, including several police checkpoints. “At one such checkpoint, north of Mukachevo, about 2km from the alleged incident scene, the SMM saw the Security Service of Ukraine (SBU) arriving, with 10 armored vans and two minibuses,” SMM said. According to SMM, three civilians and three police who had been admitted on Saturday have been already discharged.